“Giant jellyfish like this one are taking over parts of the world’s oceans as overfishing and other human activities open windows of opportunity for them to prosper, say researchers. Jellyfish are normally kept in check by fish, which eat small jellyfish and compete for jellyfish food such as zooplankton, researchers said. But, with overfishing, jellyfish numbers are increasing. These huge creatures can burst through fishing nets, as well as destroy local fisheries with their taste for fish eggs and larvae. Anthony Richardson of CSIRO Marine & Atmospheric Research and colleagues reported their findings in the journal Trends in Ecology and Evolution to coincide with World Oceans Day. 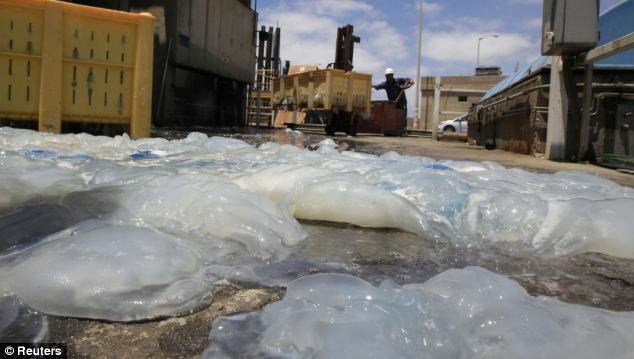 A surge of jellyfish in Israel clogged up the Orot Rabin nuclear power station in Hadera, a day after the Torness nuclear facility in Scotland was closed in a similar incident. 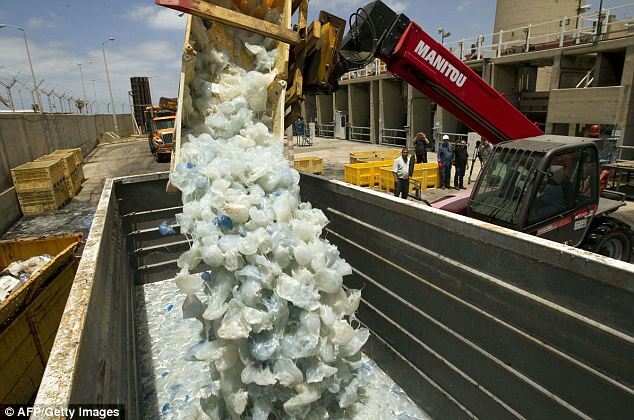 Hadera ran into trouble when jellyfish blocked its seawater supply, which it uses for cooling purposes, forcing officials to use diggers to remove them. In Florida, Beach Patrol spokeswoman Captain Tamara Marris reported staggering jellyfish sting statistics but stressed that no victims were seriously injured. Amid soaring temperatures in the sunshine state, Jellyfish targeted sunseekers along a 20-mile stretch from Ormond Beach to New Smyrna Beach. The influx was thought to be down to onshore winds bringing more jellyfish into contact with bathers. Beach officials identified two species as the culprits – moon and cannonball jellyfish – but say moon jellyfish are likely to be the main culprits. ‘The cannonball jellyfish is not really a stinging jellyfish,’ Marris said. ‘It’s really not a seasonal thing. They are just at the mercy of the wind and current, so they can show up any time of the year.’ Scientists say the number of jellyfish are on the rise thanks to the increasing acidity of the world’s oceans driving away the blubbery creatures’ natural predators. The warning came in a report into ocean acidification – an often overlooked side effect of burning fossil fuel. Studies have shown that higher levels of carbon dioxide in the atmosphere doesn’t just trigger climate change but can make the oceans more acidic. Since the start of the industrial revolution, acidity levels of the oceans have gone up 30 per cent, marine biologists say. The report, published in December 2010 by the UN Environment Programme, warns that the acidification of oceans makes it harder for coral reefs and shellfish to form skeletons – threatening larger creatures that depend on them for food. The decline in creatures with shells could trigger an explosion in jellyfish populations. The report, written by Dr Carol Turley of Plymouth University, said: ‘Ocean acidification has also been tentatively linked to increased jellyfish numbers and changes in fish abundance.’ Jellyfish are immune to the effects of acidification. As other species decline, jellyfish will move in to fill the ecological niche. Populations have boomed in the Mediterranean in recent years. Some marine scientists say the changing chemistry of the sea is to blame. 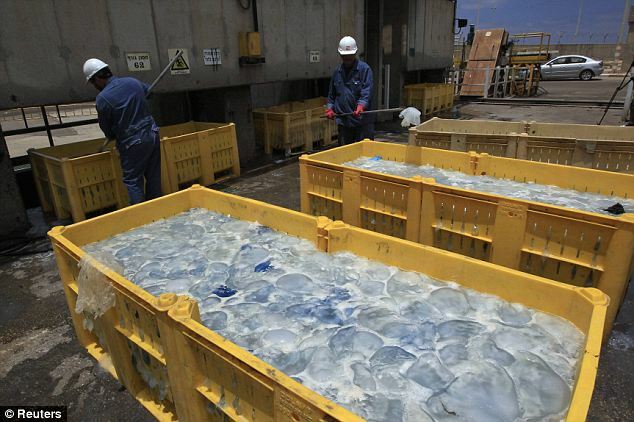 Nomura’s jellyfish have been known to wreak havoc in Japanese waters. They destroy fishing nets, poison fish in the nets and render them unfit for sale, sting humans and even disable nuclear power stations by blocking pumps used to cool the reactors. In 2007, there were 15,500 reports of damage caused to fishing equipment by jellyfish in the region, The Daily Telegraph reported. Many fishermen have tried to keep jellyfish out of their nets by using sharp wires. That the mere motion of animals could play a profound role in water-column commingling was once considered absurd. The sea would surely absorb the force of a flapping fin, to say nothing of a phytoplankton’s flagellae. It was a basic principle of friction, applied to water. But in recent years, this consensus has sprung some leaks. When added up, winds and tides don’t quite provide enough energy to account for the amount of water-mixing observed in the seas. In 2004, a study found that a school of fish could cause as much turbulence as a storm. Other researchers soon suggested that ocean swimmers could account for the gap. Soon after that, ocean physicists measured enormous turbulence generated by a swarm of krill, a crustacean considered too small to have meaningful mixing effects. Katija and CalTech bioengineer John Dabiri have provided the first direct observation of this phenomenon. Using fluorescent dyes and underwater video cameras, they’ve made visible the invisible, producing videos of swimming jellyfish trailed by the water they came from. If the video seems like an infinitesimal drop in the bucket compared to winds or tides, consider that most of the ocean — excepting the top 300 feet or so — is so placid that a couple hand-held kitchen mixers could stir a cubic mile of it. Jellyfish and other related creatures may be helping to reduce the effects of climate change by stirring up the oceans, according to a new study in this week’s issue of the journal Nature. The finding is the latest in a decades-old debate over whether swimming animals can contribute significantly to ocean mixing, the process by which warm water on the surface combines with the cold water far below. Mixing plays a role in global climate change because carbon dioxide in the air above oceans dissolves in the surface water. Through mixing, it can get pulled into the depths and stored there for long periods. The process is also a key regulator of the Earth’s temperature and the ocean’s nutrients. “It’s important for us to understand the dynamics of the ocean in order to really understand what’s going to happen to climate over land,” says John Dabiri, a bioengineer at California Institute of Technology in Pasadena and co-author of the paper. Tides and winds are known to be major players in ocean mixing, but some researchers believe that animals might also contribute. Dabiri and his graduate student Kakani Katija decided to find out by filming dozens of jellyfish as they swam in the wild. Studying the movies shows that the simple animals drag water behind them as they swim. It’s a little bit like a bicyclist in the Tour de France, says Dabiri: “When Lance Armstrong is riding down the road, he’s actually taking quite a bit of the surrounding air along with him, and the animals are doing something similar in the water.” To avoid predators, jellyfish and related animals often hide far below the ocean’s surface during the day and swim to the surface at night to feed, according to William Dewar, an oceanographer at Florida State University in Tallahassee who was not involved with the study. If the work is correct, then it could mean that they’re ferrying cold water to the surface and warm water into the depths of the sea with each feeding cycle. In the process, they may be taking dissolved carbon dioxide with them far beneath the sea, changing the overall carbon balance in the atmosphere. But, Dewar adds, there’s a still a long way to go before scientists can say for sure that animals like jellyfish are helping to regulate the climate. Larger-scale studies need to be carried out to understand where marine animals are living and how they move. “What I think we can say at the moment is that it’s a plausible idea,” he says. Swarms of tiny shrimp-like crustaceans known as krill could have a big impact on ocean life, by churning the waters and bringing nutrients from the depths up to the surface. The discovery also suggest that sea life could contribute to mixing gases in the ocean. This might influence how gases such as carbon dioxide, linked to global warming, get trapped underwater. The windswept surface layers of the open seas can teem with life, but scientists could not completely explain why, since predictions suggested not enough nutrients rise up from the abyss below to account for such abundance. The researchers, from the University of Victoria in Canada, investigated swarms of krill in Saanich Inlet, a fjord on Vancouver Island. The crustaceans migrate to the surface daily as night approaches and retreat downward as day breaks. Over the course of three dusks and two dawns, using data gathered in boat expeditions, the researchers discovered that in the roughly 10-minute bursts in which the krill migrated, they increased turbulence by up to thousands of times. “I was initially skeptical that biologically linked turbulence could be significant. I was surprised at just how large it could be,” researcher Eric Kunze, an ocean physicist, told LiveScience. These findings suggest krill and other sea life could prove critical in bringing nourishment up from the ocean depths, which are loaded with nutrients released by surface organisms that died and sank. “The question now is how frequently and how significant any biologically linked turbulence really is,” Kunze said. The most likely animals to generate large amounts of ocean turbulence are roughly inch-sized creatures that travel together in large schools or swarms, he speculated, such as anchovies, sardines, herring or squid. The rock star mantra of “live fast, die young” works in reverse too – you can trade off enjoyment for endurance. Don’t smoke, drink or eat meat and you can extend your life by decades, though what you’re going to do with all that time is another question. Now it seems that an animal has taken this to the logical extreme, and can live forever – the only drawback being it lives forever as a small clump of jelly. The Hydrozoan, a small predatory sea creature like a jellyfish but without all their well known exciting higher functions, can achieve the dream of millions and become a child again. When adverse environmental conditions threaten death it can collapse into a rugged blob of cells to survive. When it re-emerges, it does so as a child – literally building itself up all over again. Since this isn’t just a shell to hide in, but a complete structural restart, it seems possible that it could keep this up forever. Since one of these adverse environmental conditions is “getting sucked into the ballast tanks of a freighter”, the hardy hitchhiker has spread all over the globe. It possesses stingers and eats things, which are definitely qualities you don’t want in something that’s unkillable and spreading worldwide, but if you’re larger than a shrimp you’re still safe. If you are currently smaller than a shrimp, get Rick Moranis to block the laser and try to be in a better comedy next time. We aren’t in any immediate danger of knock-on effects either, as the jetsetting jellyfish-ettes seem to be integrating quite harmlessly into their new homes (though some shrimp might disagree). The rather damp phoenix-stylings of the hydrozoan have obviously made them a hot topic in genetics, but don’t expect to buy your immortality pills just yet – this is one life extension option that isn’t even remotely applicable to humans. The world–and especially the world’s oceans–are full of strange animals, but the weirdest may be the Nomura jellyfish. It can measure up to 6 feet in diameter and weigh more than 450 pounds. Half a dozen can break fishing lines and give a Japanese fisherman a fit. About four years ago, the giant jellyfish started to gain notice when fishermen, fishing the Sea of Japan for anchovies, salmon and yellowtail, were instead catching these sea monsters in their massive fishing nets. Now the jellyfish are again gathering in the Yellow Sea off China and the Korean peninsula. It is expected to drift into the Sea of Japan in the next few months. Last time the situation got so bad, the salmon boats in northern Japan stopped going out, and it’s reported that in some places fishermen lost 80 percent of their income. The nuclear power plants along the Japan Sea coast even sucked the jellyfish into their water pumps used to cool the reactors. Q. What types of damage have jelly swarms caused? * Tourism in Australia where deadly box jellies live and in the Mediterranean where stinging jellyfish closed down many beaches during the summer of 2008. * Many important fisheries, including the Gulf of Mexico, where jellies regularly clog nets, fowl fishing gear or prey on eggs and larvae of fish. * Aquaculture operations are often affected. One particular example was in 2007 when an extraordinarily large swarm of jellyfish virtually wiped out a salmon farm off northern Ireland. * Seafloor diamond operations off the coast of Namibia, where jellies have clogged vacuum pipes. * Nuclear power plants in many locations. Recently, in November 2008, a jelly swarm clogged intake pipes at the Diablo Canyon power plant in California, and thereby caused a temporary plant shut-down. Q. How densely are jellies packed together in swarms? A. In most cases, a dense swarm would be a few animals in one cubic meter of water. However, in extreme cases, there can be more jellies than water. Such swarms may cover a hundred miles of more of coastline at a time. Q. Are jelly swarms natural phenomena? A. Yes. Jellies have likely swum and swarmed in our seas for over 600 million years. When conditions are right, jelly swarms can form quickly. They appear to do this for sexual reproduction. Since males need to release gametes (sperm) into the water, they need to be very close to females. Therefore swarming behavior is just a way for them to be close to each other. Q. Are jelly populations increasing? A. In some locations, jelly populations are increasing. But such increases are regional in nature; we do not have evidence that there are “global” increases due to global influences, but evidence is mounting that climate change may have an effect. Q. Are human-caused environmental problems promoting population explosions of jellies? A. Various types of environmental problems may promote the formation of jelly swarms. These problems include pollution, the overharvesting of fish, the introduction of non-native jelly species into new habitats, the addition of artificial substrate (like fishing reefs, and various offshore platforms) in the ocean and climate change. Q. How may climate change promote population explosions of jellies? A. Higher water temperatures may speed jelly reproduction as well as extend the growing season for jellies; a longer reproduction season could result in more jellies. Climate change may also increase the amount of food available for jellies. Also, climate change may change ocean currents. Changed currents may transport jellies — which drift with currents — into new habitats. Because climate change appears to be a world-wide phenomenon, climate change may have worldwide impacts on jellies. But we really don’t know yet what the details regarding interactions between climate change and jelly populations. Q. In light of the abundance of jellies, why don’t we know more about them? A. Marine ecologists have traditionally regarded jellies as mere nuisances that interfered with studies of truly important creatures. Because of such attitudes, ecologists have traditionally gone to great lengths to avoid jellies, rather than to study them. In fact, in the past, when scientists accidentally caught jellies in their research nets, they often did horrific things to jellies — like pouring bleach over them in order to dissolve them away without destroying the hard critters that they really wanted to study. Because jellies have traditionally been understudied, we don’t have many accurate long-term records of their population sizes. Therefore, in many places, we can’t yet say for sure whether or how much jelly population sizes may be changing. Q. Are jellies finally getting the respect they deserve? A. Appreciation of the ecological importance of jellies has steadily grown since the 1980s, when jelly populations exploded in several ecosystems, including the Black Sea. More scientists are now studying jellies in more locations than ever before. Q. Why are jellies particularly difficult to study? A. Jellies are fragile and so they are often destroyed when we try to collect them in nets. Also, jellies are difficult to preserve because their bodies are destroyed by many types of preservatives. Plus, many types of jellies are too big or too small to be raised and studied in captivity. Q. Have you ever been badly stung by jellies while researching them? A. Yes, but not more than an uncomfortable sting. I do have colleagues that have been hospitalized while studying jellies, though. Q. In light of the fact that jellies are difficult to study and the ocean is so complex, how can scientists identify the individual impacts of each type of environmental disturbance on jelly populations? A. By developing computer models of marine ecosystems. One of my main activities now is to help build such models, and then manipulate various factors in these models — such as water temperature or salinity and the size of fish harvests — in order to identify their relative influences on jelly populations. Q. If some places have too many jellies, why don’t people just eat them? A. Some jellies are eaten by humans and have long been considered a delicacy in some Asian countries. In addition, processed jellies are sold in some Asian food stores in the U.S.
A. Absolutely not! Jellies are much better than cockroaches! Jellies represent among the oldest living animals on Earth and if the past is prologue, these highly successful creatures will continue to thrive even under the changing conditions of today’s oceans. I have said before that most likely cockroaches will be long gone when the last jelly swims in a lonely sea. The dramatic proliferation of jellyfish in oceans around the world, driven by overfishing and climate change, is a sure sign of ecosystems out of kilter, warn experts. “Jellyfish are an excellent bellwether for the environment,” explains Jacqueline Goy, of the Oceanographic Institute of Paris. “The more jellyfish, the stronger the signal that something has changed.” Brainless creatures composed almost entirely of water, the primitive animals have quietly filled a vacuum created by the voracious human appetite for fish. Dislodging them will be difficult, marine biologists say. “Jellyfish have come to occupy the place of many other species,” notes Ricardo Aguilar, research director for Oceana, a international conservation organization. Nowhere is the sting of these poorly understood invertebrates felt more sharply than the Mediterranean basin, where their exploding numbers have devastated native marine species and threaten seaside tourism. And while much about the lampshade-like creatures remains unknown, scientists are in agreement: Pelagia noctiluca — whose tentacles can paralyze prey and cause burning rashes in humans — will once again besiege Mediterranean coastal waters this summer. That, in itself, is not unusual. It is the frequency and persistence of these appearances that worry scientists. Two centuries worth of data shows that jellyfish populations naturally swell every 12 years, remain stable four or six years, and then subside. 2008, however, will be the eighth consecutive year that medusae, as they are also known, will be present in massive numbers. The over-exploitation of ocean resources by man has helped create a near-perfect environment in which these most primitive of ocean creatures can multiply unchecked, scientists say. “When vertebrates, such as fish, disappear, then invertebrates — especially jellyfish — appear,” says Aguilar. Which is why Brierley and other experts were not surprised to find a huge surge in the number of jellyfish off the coast of Namibia in the Atlantic, one of the most intensely fished oceans in the world. Climate change has also been a boon to these domed gelatinous creatures in so far as warmer waters prolong their reproductive cycles. 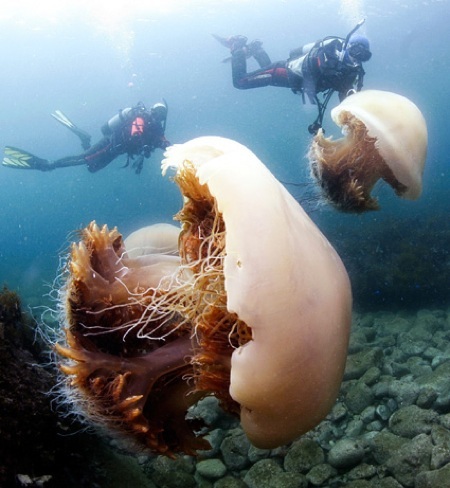 But just how many millions, or billions, of jellyfish roam the seas is nearly impossible to know, said scientists. For one things, the boneless, translucent animals — even big ones grouped in large swarms — are hard to spot in satellite images or sonar soundings, unlike schools of fish. They are also resist study in captivity, which means a relative paucity of academic studies. “There are only 20 percent of species of jellyfish for which we know the life cycle,” said Goy. And the fact that jellyfish are not commercially exploited, with the exception of a few species eaten by gastronomes in East Asia, has also added to this benign neglect. But the measurable impact of these stinging beasts on beach-based tourism along the Mediterranean has begun to spur greater interest in these peculiar creatures whose growing presence points to dangerous changes not just in the world’s oceans, but on the ground and in the air as well.